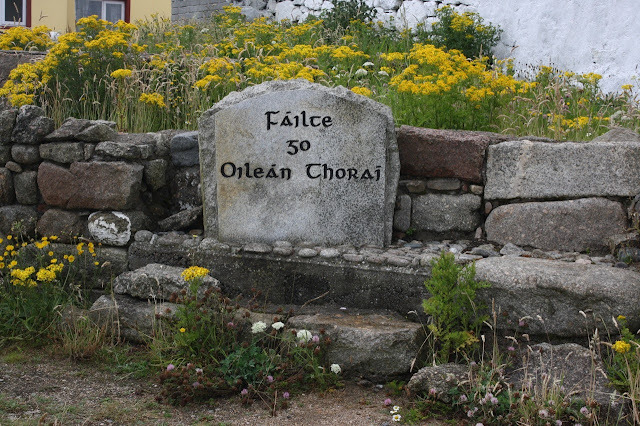 The day we went to Tory Island, there was much singing of Báidín Fheidhlimi. 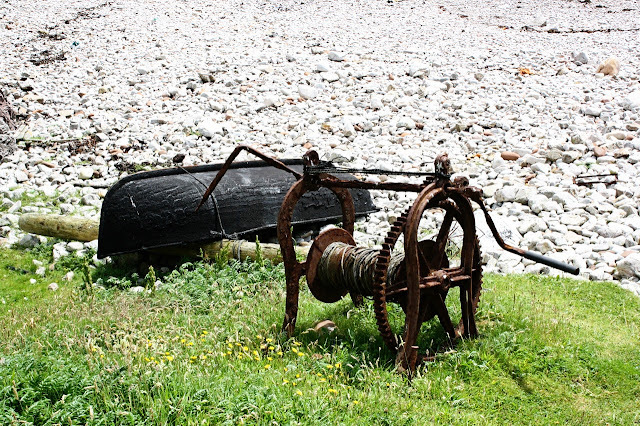 This is a song that every Irish child learns, about a fisherman (Feidhlimi) who takes his boat to Tory with sad consequences. (For lyrics and translation see here.) It's actually quite a jolly song, in spite of the whole shipwreck thing. Anyway, I'm glad to report that we made our way safely to Tory. 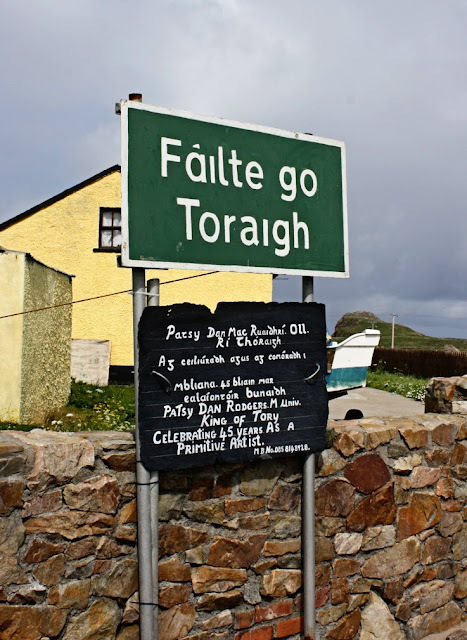 Of all Ireland's offshore islands I read somewhere that it is the farthest offshore and the ferry trip takes about 45 minutes. Like many Irish islands, Tory is a Gaeltacht, and Irish is the first language of the islanders. One of the things that makes Tory special is the fact that the island has its own king, Rí Thoraigh, who is elected by the islanders. 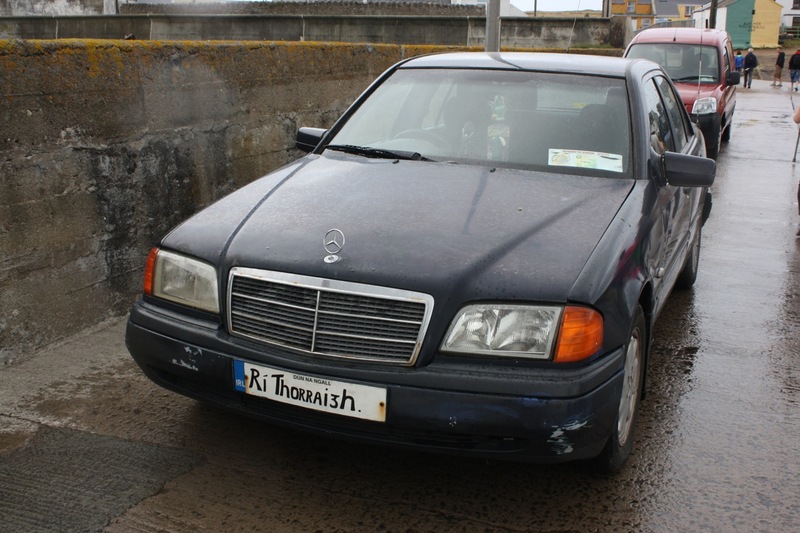 The current king, Patsy Dan Mac Ruadhri, meets every ferry at the quay, driving up alongside in his royal Mercedes. Please note the personalised numberplate. 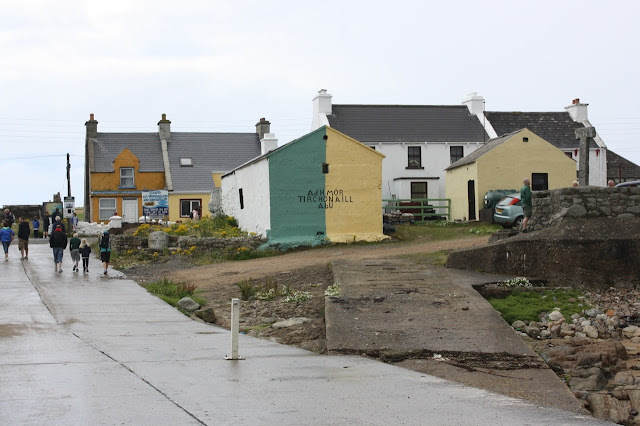 The hub of island life is an Baile Thiar, the west village, where the hotel/pub, cafe and a couple of shops are located, as well as the ferry dock. 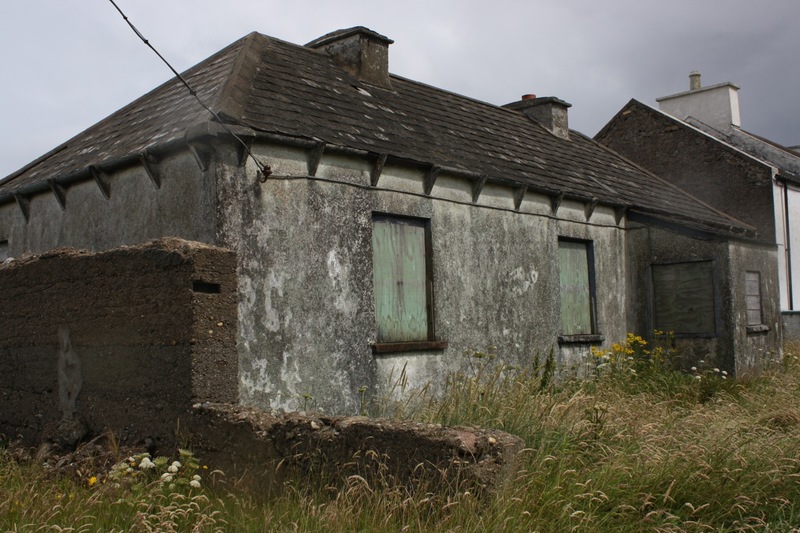 Despite the island's relative remoteness, the inhabitants are still proud Donegal supporters, which is why so many of the buildings are painted green and gold, the colours of the county football team. 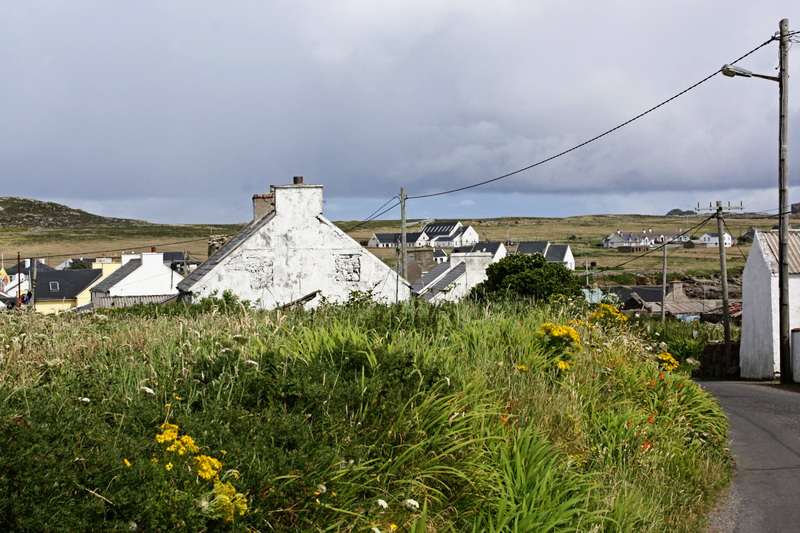 Happily, the green and gold buildings blend well with the island's natural colour scheme. In Celtic mythology, Tory is famous as the island where Balor of the Evil Eye cast his daughter Eithne into prison because it was foretold that her son would kill him. As these things usually worked out, Eithne still managed to bear a son who did, in fact, kill his grandfather. Since I feel a certain solidarity with all Eithnes, I'm glad she had the last word. 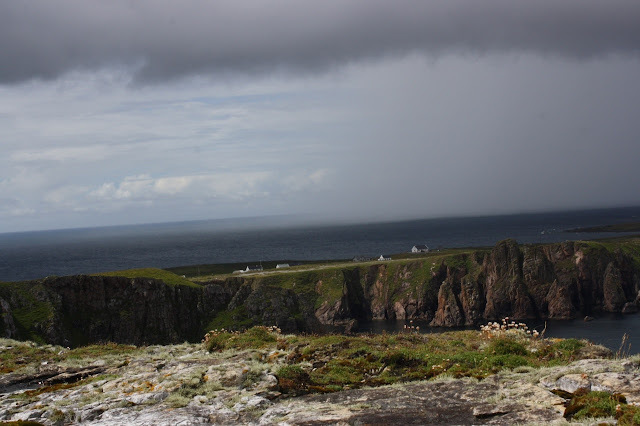 We walked to the far end of the island, to Balor's fort (the cliffs on the east end of the island which have the remains of a prehistoric settlement) passing several currachs on the way. I liked this one and the abandoned machinery - some kind of winch for pulling in boats? - beside it. 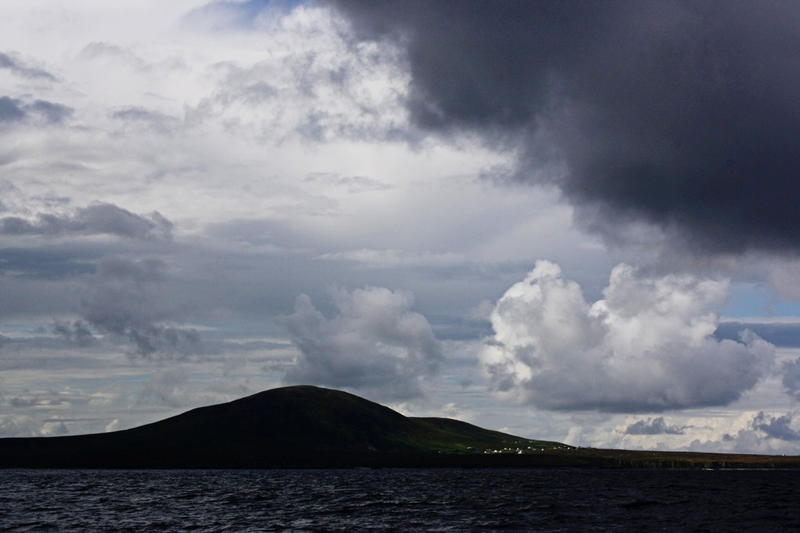 The island is decidedly dramatic: with little vegetation, you get spectacular views from end to end. From the cliffs, we walked back to village and had excellent chowder at the Harbour View Hotel. I'd tell you to make sure and visit it if you're ever on Tory - except that as it's the only pub on the island you almost certainly would anyway. Tory is bleaker than other Irish islands I've been to. It's remote and windswept and, apart from a few sheep, there's very little in the way of farming. You get the distinct impression that life here has always been hard. But it is has that stripped down, bare beauty that I've seen on Greek islands, where the colours are pure and intense against the sea and sky. 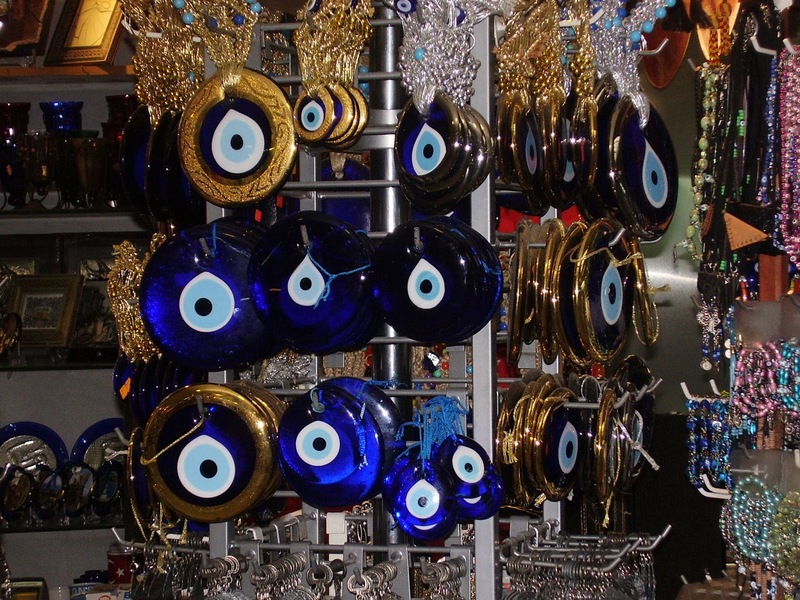 Come to think of it, Balor of the Evil Eye does sound a bit Greek ... Perhaps the island shop needs to stock up on some Ματόχαντρα.